Experience the Midwest’s last great wilderness with a motorcycle or auto tour. Enjoy breathtaking views of Lake Superior, numerous waterfalls and some of the most pristine forests in the United States. Here are just a few suggestions for touring the Porcupine Mountains area. From Silver City, travel west on 107th Engineers Memorial Highway, then turn south on South Boundary Road. Stop and see Little Union Gorge Falls and then five miles later, Nonesuch Falls. Continue west through the forest along South Boundary Road for more than 25 miles and enjoy some of the most remote and rugged woodlands in the upper Midwest. 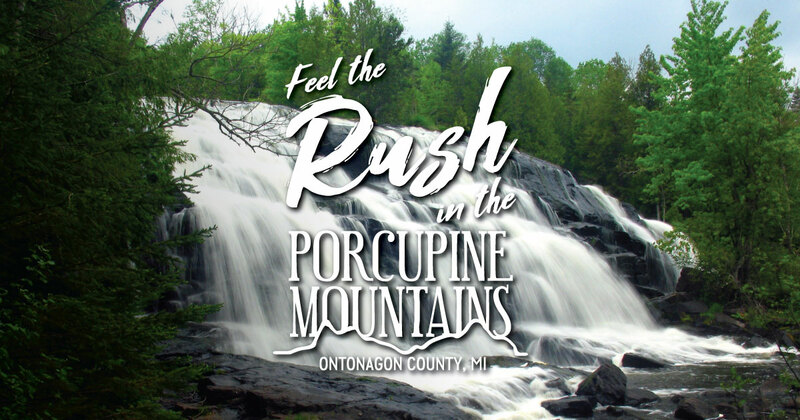 Where the road bends south at the westernmost edge of the Porcupine Mountains Wilderness State Park, you’ll find three outstanding waterfalls on the Presque Isle River—Manabezho, Manido and Nawadaha. From here, continue south on County Road 519 to Wakefield. Then head east on M-28 to Bergland, located on the northern shore of Lake Gogebic. From Bergland, head north on M-64 back to Silver City. From Ontonagon, head west on M-64 to Silver City, enjoying breathtaking Lake Superior vistas. In Silver City, head south on M-64, then south to Bergland. Travel east along M-28, passing through Ewen and connecting with Highway 45 at Bruce Crossing. Go north on Highway 45 to Rockland, then continue north back to Ontonagon. Attractions in Ontonagon include the Ontonagon County Historical Society Museum and Ontonagon Lighthouse. This short drive starts in Ontonagon. Head south on Highway 45 to Rockland. In Rockland, connect with Victoria Dam Road and travel southwest into the forest. About five miles from Rockland, be sure to stop and see the Victoria Dam, an engineering wonder, and the Old Victoria Restoration. Continue west on Victoria Dam Road, enjoying rugged forest scenery until you get to Norwich Road. Take Norwich Road north through untouched woodlands towards Lake Superior. When you reach M-64, turn right and head back into Ontonagon. Plan on starting this drive late in the day. From Ontonagon, head south on Highway 45 through Rockland. At Bruce Crossing, continue east on M-28, which will take you to Agate Falls, one of the U.P.’s most beautiful waterfalls. Continue on M-28 until you see signs for the Bond Falls. Be sure to stop and take a picture of these beautiful falls. Continue on Bond Falls Road as you loop back to Highway 45. Take Highway 45 south of Paulding to Old Highway 45, and you’ll find the Paulding Light, a mysterious light that observers can see after the sun sets. If you are lucky enough to see the light, you’ll have a lot to talk about on your late-night drive back to Ontonagon. From Ontonagon, head east on M-38 toward Greenland. Adventure Mine is an interesting stop along the way. From Greenland, travel east to M-26 and take it north through the Copper Country State Forest. Stop in Houghton to explore this charming town, home to Michigan Technical University. Further north on M-26 (past Eagle River), you’ll find The Jampot, where you can purchase homemade jams and baked goods made by a community of monks who live there. Further up the road is Eagle Harbor, home to a beautiful red brick lighthouse. Continue on M-26 to the end of your trip—Copper Harbor, on the very tip of the Keweenaw Peninsula. The Porcupine Mountains are also located along the Lake Superior Circle Tour Route. White Pine, Silver City, Ontonagon, Rockland and Greenland are all located directly on the route, which runs for 1,300 miles through Michigan, Wisconsin, Minnesota and Ontario.